1928 Cottage-Just Steps To Downtown and Amphitheater! $10 Off Ski Lift Tickets! This is a cozy "Roaring Twenties" cottage. This period home is a pictorial tribute to my grandfather who homesteaded at Sparta, near Baker City about 1910. Full kitchen with appliances, utensils, coffee and condiments. Cable TV, dvd player, internet and landline telephone. 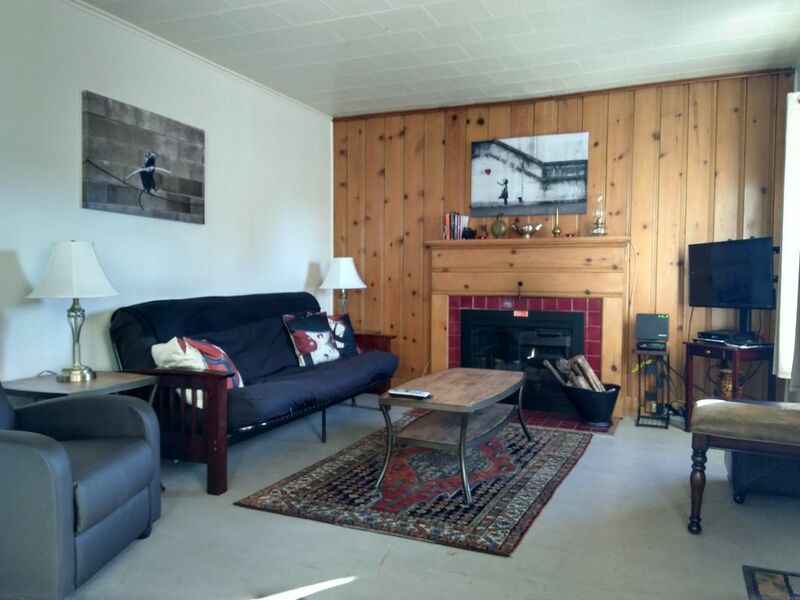 Single bathroom with shower/tub/bidet and a cozy living room with a fireplace and wood laid in the fireplace upon your arrival for that quality time after a day of skiing! AND, YES, WE HAVE PARTNERED WITH ANTHONY LAKES SKI RESORT TO OFFER $10 OFF DAILY LIFT TICKETS FOR EACH OF OUR GUESTS!! Near the Powder River and the beautiful and peaceful "River Walk" which traverses the river and will take you directly to Geiser-Pollmon Park. Also, the home is located essentially across the street from Central Park and the Amphitheater where the summer movie series is shown in August and other events take place during summer months! I was born and raised on a sheep and cattle ranch in North Powder, OR just 21 miles N. of Baker City, and went to Junior High and High School In Baker(As it was known then). I currently live in Western Oregon with my wife, Urmi, of 35 years, although my heart remains in Baker. We have 2 boys who reside in San Diego, CA and Bend, OR. We have traveled the world extensively and understand the importance of feeling comfortable during your stay and intend to make it the best ever! We wanted a period bungalow that is light and cozy with a fireplace and VERY close to downtown. This home is it! This home also keeps me connected to Baker City and all the wonderful people that reside here. Park Your Car! You are in walking distance of downtown Baker City-Main Street is one and a half blocks away. The beautiful Powder River is just steps away from this home as is the peaceful "River Walk" which traverses the river and will take you directly to Geiser-Pollman Park! You are located across the street from Central Park and the Amphitheater, too! All the summer festivals/events in Baker City take place at these two parks! Close by places include Sumpter, famous for it's gold production in the 19th and 20th centuries, The Hells Canyon Recreation Area, Anthony Lakes Mountain Resort, Wallowa Lake, numerous reservoirs and all of the Blue Mountains to the West and the Eagle Mountains to the East. Please Note: This home is a work in progress. New windows are in, but exterior and interior window trim/sills will not be painted/stained until next spring. The wood floors are in various stages of being stripped and refinished. All unfinished issues are strictly cosmetic. Easily walk to Main St. eateries, retailers, breweries and distilleries or follow the peaceful River Walk along the Powder River to Geiser-Pollmon Park where it all happens around the band shell! Anthony Lakes Ski Resort is app. 20 miles to the West. Rentals available at the lodge. Old School Land Line Wall Phone. Operational Too! Washer and dryer in basement. Available upon request-$10 fee for combined washer/dryer usage per day. Brick Fireplace Surrounded By Knotty Pine. The First Fire Is Laid For You And More Wood is Available! Storage of bicycles and motorcycles available during stay. If you need an ethernet port you can plug into the modem. Everything you need to prepare and serve a holiday meal! Full kitchen: sugar, coffee, creamer and coffee maker, pots, pans silverware, condiments. Teapot and tea provided. Fully stocked kitchen; coffee/tea, sugar, condiments, pots, pans, dishes, silverware, etc. A Few Books Located On Fireplace Mantle. If you take one, leave one. Redbox Available at Maverik Gas Station and Convenience Store-1520 Campbell St.
Phillips Lake Brownlee Reservoir Wolf Creek Reservoir Pilcher Creek Reservoir And More! Patio with table, chairs and BBQ grill in front. Here is a link to Anthony Lakes Mountain Resort for mountain biking, hiking, skiing, fishing, etc. : https://www.facebook.com/anthonylakesmountainresort Just copy and paste in your browser window. Nice cottage. Too small for 4 guys, but we made it work. Would be great for my wife and I. Skiing was awesome! Love Baker City. This house was very clean and quaint. Thank you, Bobbi. You are always welcome so please come again! Owner worked with me very well. Excellent service!!! Thank you, Joshua! You are welcome back anytime! This bungalow is a gem! My family of 5 came in for one night on our way to Idaho and found this house to be just what we were looking for! The beds were comfortable, and the neighborhood was safe and cozy. An easy walk, about 5 minutes, to the little town of Baker City which we fell in love with. A quaint place with nice amount of restaurants and a lovely walking path right on a small river. The owners of the house were easy to communicate with and very helpful giving us the option to check in an hour earlier than normal. If we find ourselves out by Baker City we are sure to stay again! Thank you. "Thank you very much for the lovely stay! The beds were very comfortable, and at this point in our lives, it is so refreshing to arrive at a place and just let ourselves in. Also, to be able to leave when we are ready without the hassle of turning in a key. While we did not cook on this trip (we were on the road constantly & loving every minute of it) the kitchen was stocked very nicely, and we did have coffee :) Can't drive 1200+ miles in 3 days without coffee! Thank you also for supplying fans in all of the rooms! This vacation helped us complete our quest of seeing all of Oregon's 7 Wonders, and staying at your place was a very enjoyable part of it!"